Did ancient blood feuds lead to violent burials? Bodies of the deceased were buried respectfully, while families and mourners followed certain customs to honor lives lost. At least, most of the time. Now researchers are gaining insight into the social and biological factors that might have motivated violent killings and atypical burials in the Southwest’s Early Agricultural Period—and how some of the same factors may still be relevant today. 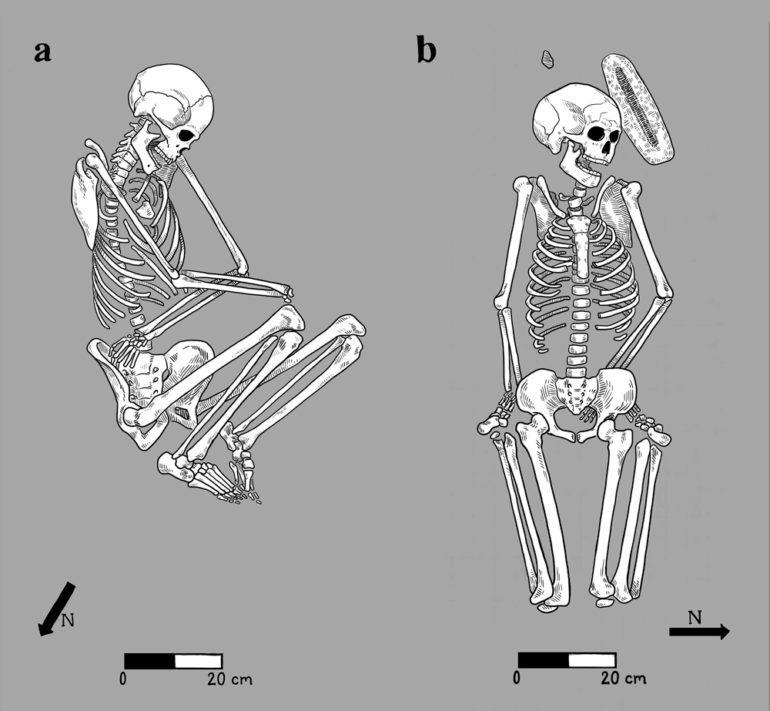 For a new study, published in the journal Current Anthropology, scientists analyzed a series of atypical burial sites in the southwestern United States and northwestern Mexico between 2100 BCE and 50 CE. The burials in the study showed evidence of a violent end; skeletal remains often included broken bones or projectile points indicating a shooting death. Yet the position of the bodies in their graves was the most telling. Awkwardly splayed or deposited in the ground headfirst, they clearly were not given customary burial treatment, in which they would have been arranged in a flexed position on their sides. The burials also lacked other standard funerary features of the time, which would have been present had the bodies been interred by family members. “These people were buried very differently than the rest of the community, and we’re trying to understand why that is,” says James Watson, associate professor of anthropology at the University of Arizona and associate director and associate curator at the Arizona State Museum. Did Bronze Age Brits mummify their dead? So-called atypical burials often are associated with victims of “bad deaths”—deaths described as unnatural, unplanned, or “evil” in nature. A common theory in the geographical area where Watson works is that the bodies belong to those accused of witchcraft. Yet, given that the corpses were not dismembered in the way suspected witches’ historically were, Watson has a different theory. These bodies may have been the victims of blood feuds, or family feuds, during a time when the population was experiencing some serious growing pains, he says. Further, the violence of these ongoing blood feuds may have become enculturated, or ingrained, in certain communities. At the root of that violence may be a desire to win prestige, which in turn has important biological implications, even though the perpetrator of violence may not be consciously thinking about those implications, Watson says. Evolutionary biology’s “costly signaling theory” may help explain what might be behind the ruthless post-mortem treatment. Similarly, the killings followed by disrespectful burials send a strong signal—one asserting power and dominance. This signal has the potential benefit of attracting prestige, and the wives and children that come with it, but it also comes with significant risk of retaliation by the victim’s family. “By creating these atypical burials—where they’re basically desecrating the bodies of the people killed—they’re signaling their prowess to gain status, but it’s at a very significant potential cost, and that is either their life or lives in their community or family,” Watson says. While the work focuses on violence that occurred 2,000 to 4,000 years in the past, Watson suggests costly signaling theory might also be applied in the context of modern-day violence. “With some of the issues that we’re seeing today—like increased violence and murders in a lot of cities, police shootings, retaliation upon police—a lot of kids are growing up in a culture of violence in certain communities, and they’re learning different values on how to interact with their environment because of the disadvantages that they have,” he says.